What’s in the Hama’s Charter? Why do so few on the Left seem to know? It is remarkable how few activists, scholars, and progressive commentators in the West have read or are even familiar with the Hamas Covenant. What is even more remarkable is that many of these same people, wholly ignorant of the contents of this document, readily protest in solidarity with this group. But what is more disturbing still, is the likelihood that some of these activists, students, and Leftist scholars have, in fact, read the Hamas charter, and, having done so, continue to support the “movement”, urging others to do likewise, diligently advancing the fashionable fiction that by promoting the cause of Hamas and the “Palestinians”, they are acting in opposition to established U.S. foreign policy in the Middle East. Nothing, in fact, could be further from the truth. If we accept the premise that Hamas represents a progressive liberation movement for the ‘Palestinian’ people against a repressive, militaristic Jewish regime, why is so little being done to make the ideology that drives it known? The document itself asserts that it was specifically intended to clarify what Hamas is, as well as outline its functions, aims, and, perhaps most importantly, that for which it stands. Yet, very little is said about it, either in the “alternative” or the corporate media, even as the movement is promoted and embraced across college campuses in North America and Europe. This Covenant of the Islamic Resistance Movement (HAMAS), clarifies its picture, reveals its identity, outlines its stand, explains its aims, speaks about its hopes, and calls for its support, adoption and joining its ranks. Our struggle against the Jews is very great and very serious. It needs all sincere efforts. It is a step that inevitably should be followed by other steps. The Movement is but one squadron that should be supported by more and more squadrons from this vast Arab and Islamic world, until the enemy is vanquished and Allah’s victory is realised. “The Day of Judgement will not come about until Moslems fight the Jews (killing the Jews), when the Jew will hide behind stones and trees. The stones and trees will say O Moslems, O Abdulla, there is a Jew behind me, come and kill him. Only the Gharkad tree, (evidently a certain kind of tree) would not do that because it is one of the trees of the Jews.” (related by al-Bukhari and Moslem). Given the recent hostilities, one would imagine this information would at least get a passing mention in the mainstream media to serve the Washington “pro-Israel agenda” most accept as the basis of U.S. foreign policy in the Middle-East. Yet, it’s virtually never discussed. Tune in to MSNBC, CNN, ABC, as well as NPR, RTV, Al Jazeera, and DemocracyNow– read the Huffington Post, the New York Times, or the latest droppings in one’s inbox from Truthout, and one finds a startling unanimity of voice in that any real discussion of the ideology to which Hamas adheres is absent entirely. Crucial information is being withheld from the American public, not just by the powerful corporate owned media in league with the Washington elite, but also by the “alternative” media. Why? The Islamic Resistance Movement is one of the wings of Moslem Brotherhood in Palestine. Moslem Brotherhood Movement is a universal organization which constitutes the largest Islamic movement in modern times. The Muslim Brotherhood, founded in 1928 by Hassan Al Banna in Egypt, has long been recognized as a fascist organization by Leftists and moderate Muslims throughout the Arab world. Until recently, it had been outlawed in many Arab countries, including in Egypt and Syria. All that has changed; the Muslim Brotherhood is now being embraced openly by the Obama White House. It is a policy, however, that was well underway during both the Bush, and Clinton presidencies. In 2008, the International Crisis Group (ICG), whose members include Obama Presidential Advisor Samantha Power, Zbignew Brzezinski, former Supreme Commander of NATO Wesley Clark, and George Soros, issued a key “policy edict” that Egypt grant the Muslim Brotherhood the status of a political party; it was a policy initiative the White House fully endorsed, and successfully executed, backing the fascist group’s rapid ascension to power, not just in Egypt, but across the Arab world. Former Secretary of State Madeline Albright, as head of the U.S. – Muslim Engagement Project has also urged greater engagement with Hamas, the Muslim Brotherhood’s Palestinian wing, reportedly with the encouragement of fellow member Imam Feisel Rauf, the original organizer of the Ground Zero Mosque and author of the book What’s Right with Islam is Right with America. Over a period of several years, Feisal Rauf has also served as an official U.S. emissary to the Arab world for both the Obama and Bush administrations. Concurrent with his activities on behalf of the United States government, he was listed as one of a select group of “Players and Contributors” with Perdana, one of the humanitarian front groups financing the pro-Hamas 2010 Gaza Flotilla; it is a title he shared with prominent Leftist scholar Michel Chossudovsky. Speaking before the Council on Foreign Relations that same year, the same Feisal Rauf recalled the many junkets to the Middle East he had taken for both Bush and Obama, boasting, proudly, that he was “bipartisan”. More recently, RAND issued a report calling for enhanced engagement with the Muslim Brotherhood by the United States, promoting it as an opportunity to “dispel misunderstandings on both sides”, and recommending that younger members of the fascist movement be brought over to the United States to speak on universities campuses. Given that the Muslim Brotherhood is the parent organization of the Muslim Student Association (MSA), the group that organizes most of the anti-Israel teach-ins and protests at universities across the United States in collaboration with “Leftist” groups like the International Action Center, they should feel right at home. In reading the Hamas Covenant further, one learns that, in addition to explicitly calling for the extermination of the Jewish people and the annihilation of Israel, the document announces Hamas’s opposition to Secularism and Communism. One would think that this fact alone would give pause to Leftist activists everywhere. 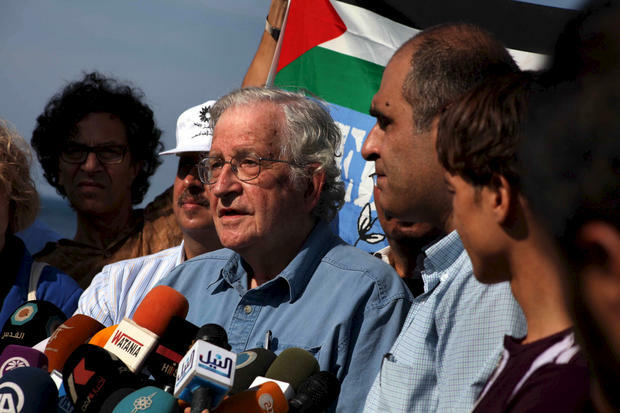 Yet, even this was not enough to deter Noam Chomsky from making a highly publicized visit to Gaza recently to meet with Hamas leaders, assuming, that is, the renown scholar and Progressive icon has taken the time to acquaint himself with the ideology of the Hamas, which is, of course, that of the Muslim Brotherhood. The Hamas Covenant has quite a lot to say on many topics. It carefully prescribes the role women should have in society, calling for the elimination of any outside influence that might lead Arab women to abandon their primary purpose: the rearing of future Islamic fighters; Muslim women, as per their Islamically prescribed duties, are also expected to possess a “sufficient knowledge and understanding where the performance of housekeeping matters are concerned”. The charter does allow for one exception to the otherwise strict limits placed on female behavior. The document stipulates that Muslim women are at liberty abandon their domestic duties to battle the enemy. This they can do without permission. The same, the Hamas Covenant says, holds true for “slaves” who likewise, under these circumstances, need not obtain permission from their “masters”. The day Islam is in control of guiding the affairs of life, these organizations, hostile to humanity and Islam, will be obliterated. The Covenant also mandates that all Art forms must be appropriately Islamic as per certain “regulations and measures” so as to help Muslims remain appropriately inspired. The Muslim claim to Israel is also explained in detail, and is especially informative. It is a claim predicated exclusively on Islamic religious doctrine. Under the Sharia (Islamic Jurisprudence), the document states, “any land the Moslems have conquered by force“ such as “[w]hen the leaders of the Islamic armies conquered Syria and Iraq,” renders that land forever Muslim until the Day of Judgment. In short, violent territorial conquest by Muslims is, under Islamic law, rewarded with exclusive possession of the conquered territory–in perpetuity–against which the conquered non-Muslim inhabits, being non-Muslim, have no standing and can make no legitimate claim. As Israel was among the nations also conquered and occupied by Arab-Muslim armies, it is this religious “legal” doctrine under Islam that governs the Muslim claim. Superseding all others, it can never be made “null and void”. There is no solution for the Palestinian question except through Jihad. Initiatives, proposals and international conferences are all a waste of time and vain endeavors. It is important to note that the Covenant was drafted many years before the “blockade”, the reason most given in the media to excuse and justify continuing Hamas attacks on Israel and the Jewish people worldwide. A quick review of recent statements made by Hamas leaders in Arabic show that they remain deeply, and uncompromisingly committed to that inscribed in this, their founding declaration. Why, than, is the “Left” so deeply and uncompromisingly committed to Hamas? Israel will exist and will continue to exist until Islam will obliterate it, just as it obliterated others before it” (The Martyr, Imam Hassan al-Banna, of blessed memory). “The Islamic world is on fire. Each of us should pour some water, no matter how little, to extinguish whatever one can without waiting for the others.” (Sheikh Amjad al-Zahawi, of blessed memory). The Islamic Resistance Movement is one of the wings of Moslem Brotherhood in Palestine. Moslem Brotherhood Movement is a universal organization which constitutes the largest Islamic movement in modern times. It is characterised by its deep understanding, accurate comprehension and its complete embrace of all Islamic concepts of all aspects of life, culture, creed, politics, economics, education, society, justice and judgement, the spreading of Islam, education, art, information, science of the occult and conversion to Islam. The Islamic Resistance Movement welcomes every Moslem who embraces its faith, ideology, follows its programme, keeps its secrets, and wants to belong to its ranks and carry out the duty. Allah will certainly reward such one. Allah is its target, the Prophet is its model, the Koran its constitution: Jihad is its path and death for the sake of Allah is the loftiest of its wishes. The Islamic Resistance Movement believes that the land of Palestine is an Islamic Waqf consecrated for future Moslem generations until Judgement Day. […] Palestine is an Islamic Waqf land consecrated for Moslem generations until Judgement Day. This being so, who could claim to have the right to represent Moslem generations till Judgement Day? This is the law governing the land of Palestine in the Islamic Sharia (law) and the same goes for any land the Moslems have conquered by force, because during the times of (Islamic) conquests, the Moslems consecrated these lands to Moslem generations till the Day of Judgement. As for the real ownership of the land and the land itself, it should be consecrated for Moslem generations till Judgement Day. […] Any procedure in contradiction to Islamic Sharia, where Palestine is concerned, is null and void. […] A woman can go out to fight the enemy without her husband’s permission, and so does the slave: without his master’s permission. It is necessary that scientists, educators and teachers, information and media people, as well as the educated masses, especially the youth and sheikhs of the Islamic movements, should take part in the operation of awakening (the masses). The Moslem woman has a role no less important than that of the moslem man in the battle of liberation. She is the maker of men. Her role in guiding and educating the new generations is great. The enemies have realised the importance of her role. They consider that if they are able to direct and bring her up they way they wish, far from Islam, they would have won the battle. That is why you find them giving these attempts constant attention through information campaigns, films, and the school curriculum, using for that purpose their lackeys who are infiltrated through Zionist organizations under various names and shapes, such as Freemasons, Rotary Clubs, espionage groups and others, which are all nothing more than cells of subversion and saboteurs. […]These organizations operate in the absence of Islam and its estrangement among its people. The Islamic peoples should perform their role in confronting the conspiracies of these saboteurs. The day Islam is in control of guiding the affairs of life, these organizations, hostile to humanity and Islam, will be obliterated. Woman in the home of the fighting family, whether she is a mother or a sister, plays the most important role in looking after the family, rearing the children and embuing them with moral values and thoughts derived from Islam. She has to teach them to perform the religious duties in preparation for the role of fighting awaiting them. That is why it is necessary to pay great attention to schools and the curriculum followed in educating Moslem girls, so that they would grow up to be good mothers, aware of their role in the battle of liberation. They were behind World War I, when they were able to destroy the Islamic Caliphate, making financial gains and controlling resources. […] They were behind World War II, through which they made huge financial gains by trading in armaments, and paved the way for the establishment of their state. The imperialistic forces in the Capitalist West and Communist East, support the enemy with all their might, in money and in men. These forces take turns in doing that. The day Islam appears, the forces of infidelity would unite to challenge it, for the infidels are of one nation. The Islamic Resistance Movement considers all these movements as a fund for itself. The Palestinian Liberation Organization is the closest to the heart of the Islamic Resistance Movement. It contains the father and the brother, the next of kin and the friend. The Moslem does not estrange himself from his father, brother, next of kin or friend. Our homeland is one, our situation is one, our fate is one and the enemy is a joint enemy to all of us. Because of the situations surrounding the formation of the Organization, of the ideological confusion prevailing in the Arab world […] the Organization adopted the idea of the secular state. And that it how we view it. Secularism completely contradicts religious ideology. Attitudes, conduct and decisions stem from ideologies. That is why, with all our appreciation for The Palestinian Liberation Organization – and what it can develop into – and without belittling its role in the Arab-Israeli conflict, we are unable to exchange the present or future Islamic Palestine with the secular idea. The Islamic nature of Palestine is part of our religion and whoever takes his religion lightly is a loser. The day The Palestinian Liberation Organization adopts Islam as its way of life, we will become its soldiers, and fuel for its fire that will burn the enemies. The Zionist invasion is a vicious invasion. […] It relies greatly in its infiltration and espionage operations on the secret organizations it gave rise to, such as the Freemasons, The Rotary and Lions clubs, and other sabotage groups. All these organizations, whether secret or open, work in the interest of Zionism and according to its instructions. They aim at undermining societies, destroying values, corrupting consciences, deteriorating character and annihilating Islam. It is behind the drug trade and alcoholism in all its kinds so as to facilitate its control and expansion. Arab countries surrounding Israel are asked to open their borders before the fighters from among the Arab and Islamic nations so that they could consolidate their efforts with those of their Moslem brethren in Palestine. Writers, intellectuals, media people, orators, educaters and teachers, and all the various sectors in the Arab and Islamic world – all of them are called upon to perform their role, and to fulfill their duty, because of the ferocity of the Zionist offensive and the Zionist influence in many countries exercised through financial and media control, as well as the consequences that all this lead to in the greater part of the world. The Zionist plan is limitless. After Palestine, the Zionists aspire to expand from the Nile to the Euphrates. When they will have digested the region they overtook, they will aspire to further expansion, and so on. Their plan is embodied in the “Protocols of the Elders of Zion”…. The Islamic Resistance Movement consider itself to be the spearhead of the circle of struggle with world Zionism and a step on the road. […] Arab and Islamic Peoples should augment by further steps on their part; Islamic groupings all over the Arab world should also do the same, since all of these are the best-equipped for the future role in the fight with the warmongering Jews. “..and we have put enmity and hatred between them, until the day of resurrection. So often as they shall kindle a fire of war, Allah shall extinguish it; and they shall set their minds to act corruptly in the earth, but Allah loveth not the corrupt doers.” (The Table – verse 64). The Islamic Resistance Movement, being based on the common coordinated and interdependent conceptions of the laws of the universe, and flowing in the stream of destiny in confronting and fighting the enemies in defence of the Moslems and Islamic civilization…, urges the Arab and Islamic peoples, their governments, popular and official groupings, to fear Allah where their view of the Islamic Resistance Movement and their dealings with it are concerned. They should back and support it, as Allah wants them to, extending to it more and more funds till Allah’s purpose is achieved when ranks will close up, fighters join other fighters and masses everywhere in the Islamic world will come forward in response to the call of duty while loudly proclaiming: Hail to Jihad. Their cry will reach the heavens and will go on being resounded until liberation is achieved, the invaders vanquished and Allah’s victory comes about. The Islamic Resistance Movement adopts Islam as its way of life. Islam is its creed and religion. Whoever takes Islam as his way of life, be it an organization, a grouping, a country or any other body, the Islamic Resistance Movement considers itself as their soldiers and nothing more. The last of our prayers will be praise to Allah, the Master of the Universe. Tags: Chomsky, Chossudovsky, Gaza, Hamas, Hamas Charter, International Crisis Group, Israel, Madeline Albright, Muslim Brotherhood, Rand, Rauf. Bookmark the permalink. If you can’t keep land taken in war,,,, does tht mean that all our land taken by ROME must be returned to the Israelite peope ?? That would indluce the land on the other side of the Jordan river that the Bridish gave to a tribe from the southern arabian lpeninsula, as well as the Sinia because at the time of the Roman conquest it WAS OUR land ! I am a little annyoed by the whole mayhem because i dont understand why its such a big deal in the first place. I think the Cordoba House, is an opportunity for those insecure, narrow minded Americans to see what actually goes on in a muslim community service. The myths of bomb plotting or building a terrorist army would soon be wiped out, since like any other religion its a place for congregational gathering the only difference is Muslims take a great deal of pride in their belief.I think the protestors will continue regardless, i just want to know would such havoc be caused if it were a Synagogue, Church or Temple being built on site??? What gets forgotten that the poor civilians that were killed/affected in the 9/11 were not just Christians but Muslims, Jews, Hindus and people of many other faiths/religon. So the attack should not be regarded as a religious attack, i think the very poorly educated Americans need to be reminded this once in a while. The worst thing then to follow is that Barack Obama is now accused by a minority of American citizens of being muslim i mean come on how shallow can you go? Just because he is advocating or allowing this house to be built, people are judging him already..whats the big deal if he was muslim anyway?? ?